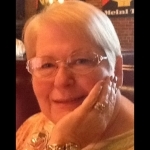 Linda Lou Arvin, 68, of Kansas City, KS, passed away Saturday, August 11, 2018. Visitation will be from 5-7:00 PM Thursday, August 16 at the Porter Funeral Home, 1835 Minnesota Ave., Kansas City, KS. Funeral Services will be 10:00 AM Friday, August 17, at the Cornerstone Community Church, 2400 North 81st Street, Kansas City, KS 66109. Burial to follow at Memorial Park Cemetery. Memorial contributions may be made to Kansas City Hospice House, 12000 Wornall Road, Kansas City, MO and Cornerstone Community Church. Linda was born October 15, 1949, in Kansas City, KS. She was a Benefit Authorizer for the Social Security Administration. She was also the co-owner, receptionist, sweeper and community relations for Hope Hair Styling. She was preceded in death by her mother and stepfather Kathryn and Owen Waller, father Joseph Fuller and brother Terry Lee Fuller. She is survived by her husband of 33 years, John, blended siblings Patricia (Mark) Couch, Catherine (Tim) Regan, Mary Simpson, James (Sharon) Stewart, a tight knit group of cousins and many nieces and nephews. Linda was a beautiful, sweet soul. She and John were a huge blessing after my Dad, Ed Rust, passed away. Iâ€™ll forever remember the times they took me to church with them. Her immense faith in Christ will be the one thing Iâ€™ll always admire about Linda. Our condolences to her husband, John, and the rest of the family. Much love to all. So sorry to hear of the passing of Linda, My heart goes out to John and all family members and close friends of them. I know she is no longer hurting and is with the lord. John, \r\nThinking about you and your family. You and Linda were such a blessing to me. It was a honor taking care of her. John,\r\nYou are in my thoughts and prayers as you journey through this time. So Sorry for your loss John. God Bless you. John, \r\nSo sorry to hear of Linda's passing. My prayers are with you.